Welcome to the New Testimonials Page! Please take a look at the finished project. I hope you will agree …. it looks great! It’s been put together at last after so long…. Thank you for assisting us with every step of the way & your great design. I have the curtain poles and tie backs. Thanks they are perfect. Just a quickie to let you know that the curtain pole has now been fitted. It looks great and are delighted with it. Thank you so much for your help and advice. It’s very rare but encouraging to find such excellent workmanship. Earlier this year you made a 25mm pole for a curved bay window for me. It fitted perfectly and looks great, we’re really pleased with it. Pole has arrived and is perfect! Thank you very much! Thanks so much for sending off the new curtain pole – it arrived as planned midday Monday. We had the pole fixed and new curtains up that afternoon. We are really delighted with all the poles you provided, and would be very happy to recommend you to anyone. Hi Stephen, you made a reasonably complicated pole for my bay back in March (it even made it into your blog)… just thought you’d like to see it in place! Need to pick the curtains now. I’d say it fits the space perfectly, thanks for your ingenious idea with the angles and bends. The pole arrived today. Thank you so much. We are very pleased with. It is perfect. We will certainly be ordering more from you once the rest of our property is finished. As doubtless many of your customers I would like to place another order please. We’re going to do the whole house as we liked the first batch so much. (Thank you). Just to let you know that this arrived on Sat, and to say thanks for getting it out. I hope that you’re well. 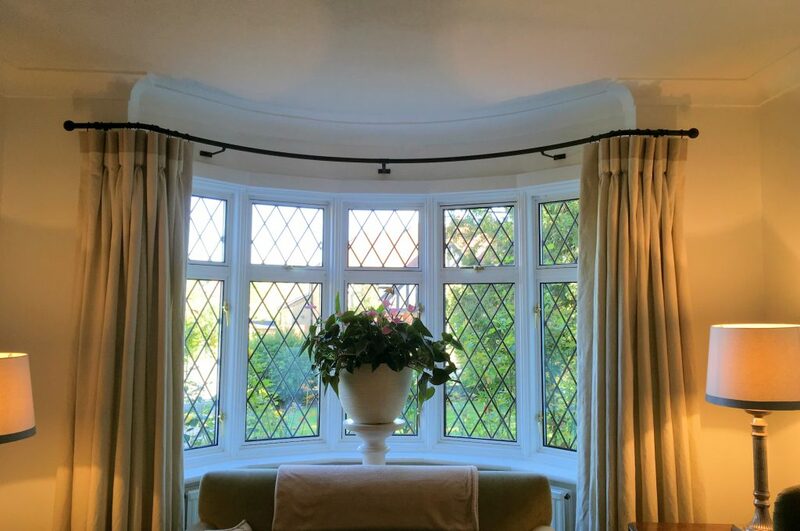 We’ve put the first bay window curtain poles that we ordered from you up and have curtains on one! Had to write to thank you for the poles which are now up, looking good and fit perfectly to boot! 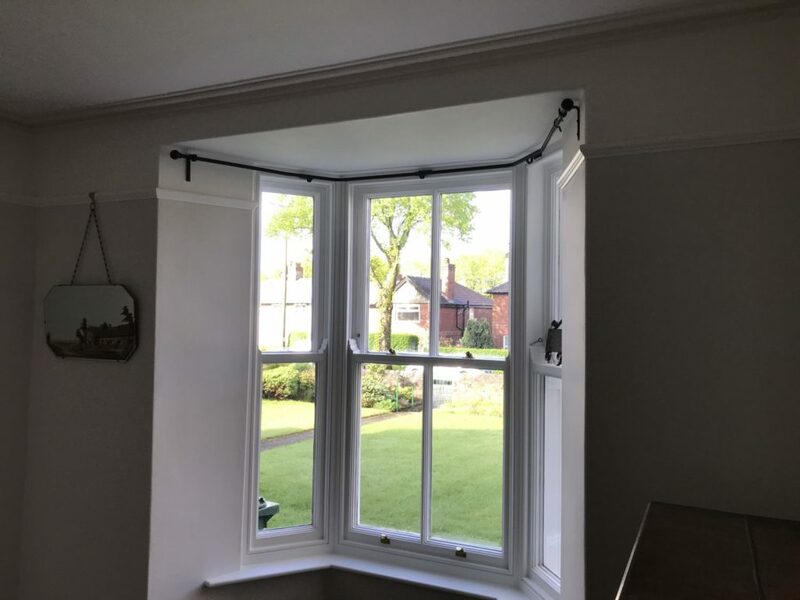 The bay window pole is especially impressive considering the tricky shape… superb workmanship all round so thanks again for all your efforts. I meant to email to say thank you for the poles – they’re great. So much so that I’d like to order some more for a client (not sure if I mentioned that I’m an interior designer?). …If you could get back to me with an invoice, I’ll pay it right away. Screws arrived today. First pole up – looks great. Just to let you know the pole is brilliant, really pleased with it. Husband managed to get it fixed over the front door and curtain hung just before the Beast from the East and storm Emma hit. Got my pole today. I’m so pleased with it. Thanks so much for your quality workmanship! Thank you so much for the curtain pole brackets which arrived today, you were so quick making them! Much appreciated, and very nice they are too. 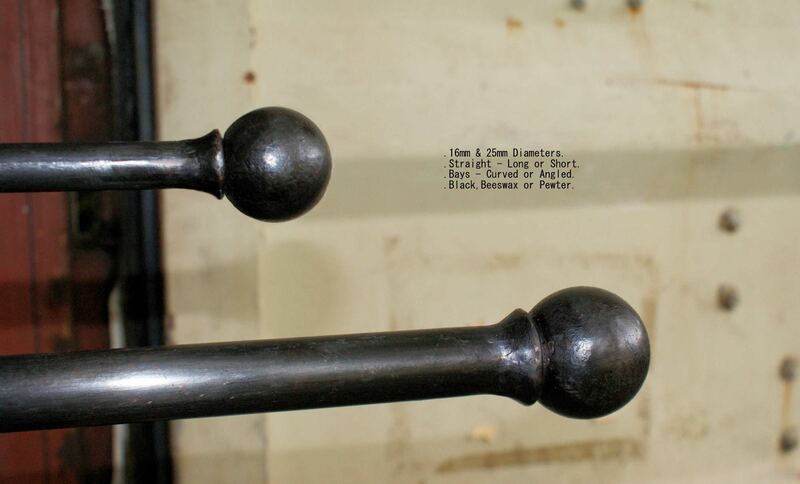 I would like to order a continuously curved curtain pole in 16mm, traditional black and with ball and collar finials. …By the way, I previous bought a similar pole from you (Stephen?) a couple of years ago. We were very pleased with it. Many thanks for our previous curtain pole. It looks great. January 2018… Happy New Year!! P.S. I bought a bay window pole from you a few months ago. It fits the bay perfectly and looks great. You made a lovely bay window pole for us a couple of years ago, we have since moved and would like to replace all the old poles in our new house with some more of your poles. Just wanted to say how pleased we are with the poles you recently made for us which are now all wonderfully in place. They look lovely and are so stylish. We will be in touch for more soon! …we’re sincerely delighted with how fantastic the rails look! Alongside our Art Deco lighting, and the old cast radiators we had restored, they’ve fitted in perfectly. The poles are all up now. And they really do look excellent. The bay window pole went in without any problems. Pretty impressive! Two things, firstly I ordered two double poles a good few months ago now and they look just as I had imagined hung on our wall, so thank you very much for the work you put in to them, I’ll definitely be recommending you if anyone mentions they are on the hunt for curtain poles! I trust you had a good Christmas. The curtain rail arrived and has been fitted. We are delighted with it but think we will probably need matching holdbacks. What dimensions are the holdbacks you advertise?